As bicyclists we travel slowly, requiring more time to cover a long distance than a car, bus or train. It is precisely in that slow travel that commerce can take hold. 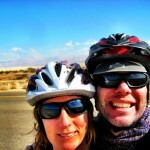 As bicycle tourists, we sometimes take up 5 days to travel 300km. That’s 4 nights of lodging and at least 15 meals in addition to other attractions. On a bike, we can stop anytime we want. For anything. As we cycle along, the area around is much more approachable. We travel in a place, not through it. The pleasant pace of traveling by bicycle affords us every chance to literally stop and smell the flowers along a roadside, shop at a local market, enjoy a a museum previously unknown to us, eat at a roadside restaurant (we eat a lot!) and stay in local accommodations. Compared with car, train or bus travel that is almost 5 times the economic impact over the same distance! Did you know most touring cyclists tend to stop at the places that encourage them to feel welcome? When we stop, we spend money. Local communities need that influx of outside currency. Why not encourage us to stop? Here’s a few things we have found that encourage us to stop and spend money. Remember, these are just our experiences. Your milage may vary. Easy and simple bicycle parking facilites are a low cost investment that small businesses and communities can invest in that will immediately show direct economic returns. It’s more likely that we will stop at a business or visit a town that has basic bicycle parking facilities. Hotels, restaurants and even town centers that install well thought, secure bicycle parking always feature high on our list of destinations. Given two otherwise identical hotels/restaurants, we would pick the place promoting bicycle parking every time. 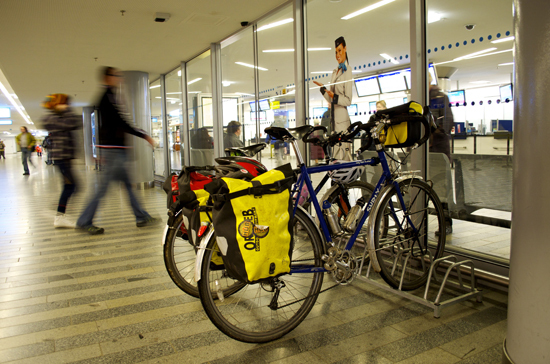 Bicycle parking at Prague Train Station makes it easy to combine train and bicycle travel. 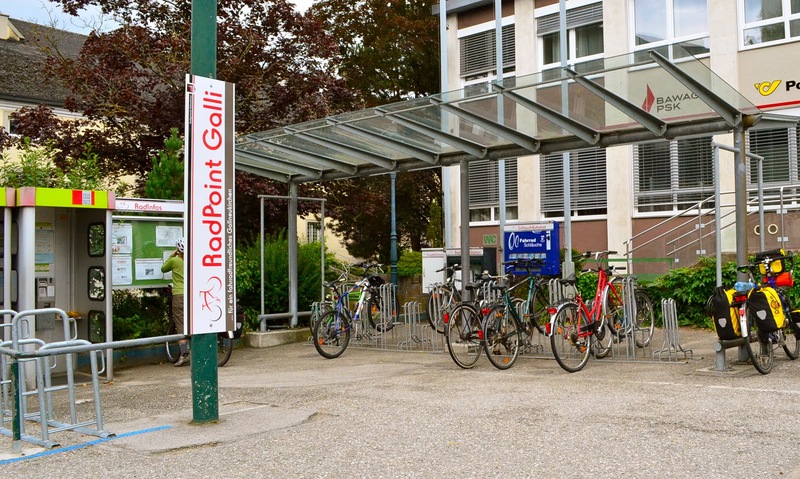 Radpoint- a self service bike parking station with inner tube vending, bicycle repair tools and an e-bike charging station. Well placed bicycle parking can not only attract the lycra-clad and self-supported touring set travelling longer distances, but even folks who fall outside of the bicycle tourist category. Locals will be more inclined to travel by bike to their favorite restaurant or attraction if well implemented bicycle parking is available. Ever gotten a flat or mechanical breakdown and not had a means of repairing it? Yeah, its happened to all of us at one point. Even the best prepared sometimes forget. Instead of melting the soles of your shoes to patch a flat or trying to duct-tape a loose carrier into place, wouldn’t it be nice if some places had basic repair facilities available for passing cyclists? Don’t you think it would be really popular? Yeah, us too. 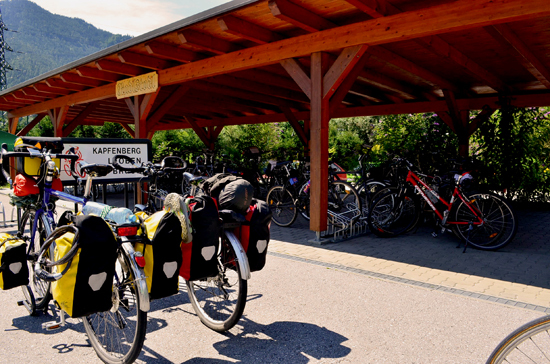 A ‘Rad-point’ – self service bicycle station with inner tube vending, repair facilities and e-bike charging station. 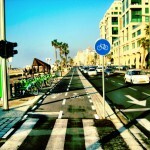 Fortunately some places like this exist and they’re getting a lot of bike traffic. 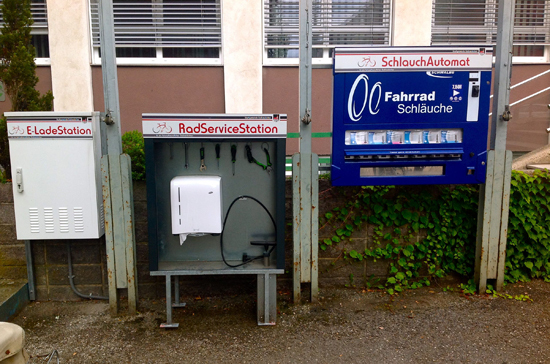 In Austria and Germany we’ve stopped at villages featuring “RadPoints”. Typically these have been in small towns. The basic RadPoints have inner tube vending, pumps, maps, and basic repair tools. Some even combine all this with pretty nice bike parking. What a great way to attract passing cyclists. It would be really great to see small businesses like hotels, restaurants and food shops add something like this even if on a small scale. 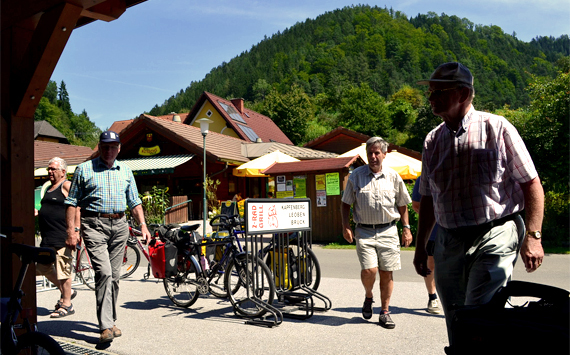 Providing pumps, tools to loan and selling inner tubes would go a long way to attracting bicycle tourism. Posting area bicycle maps in public view, outside your shop or business, lets us know you want us to stop. 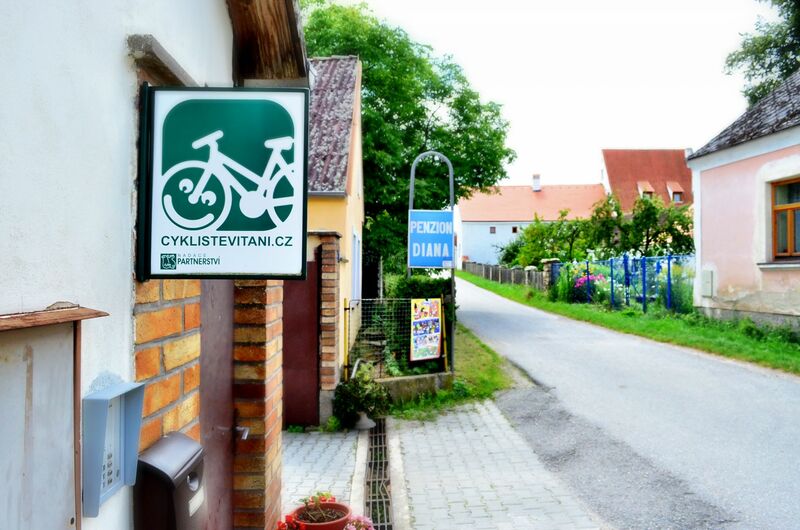 Small communities can even pool resources and place bicycle route maps or map boards in town squares featuring bicycle friendly businesses in the area. We will patronize those businesses. Post it. You’ll see! 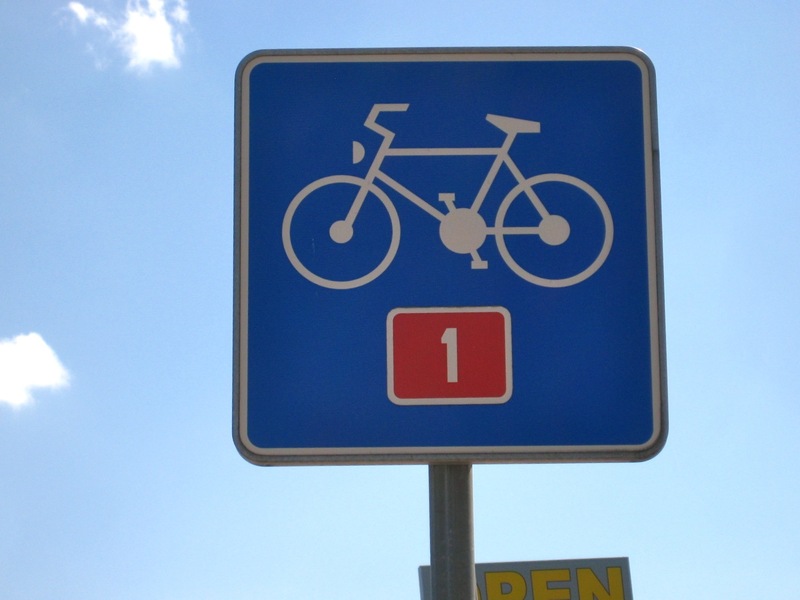 Perhaps not the simplest of things to implement, but certainly the most effective way to encourage bicycle travel is a well marked network of bicycle routes. This is one element that is always nice to have no matter where your bike travels take you. 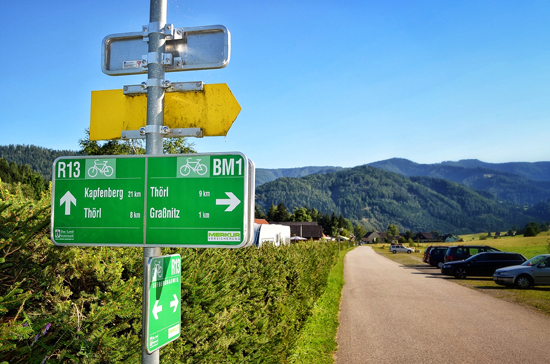 Places like Czech Republic and Austria have long recognized this and their well developed cycle routes and signage reflect a strong commitment to bike travel. 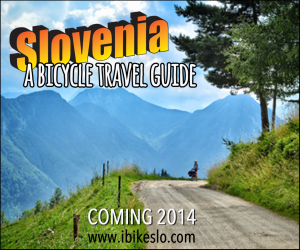 Slovenia is another up and coming player in bicycle travel. 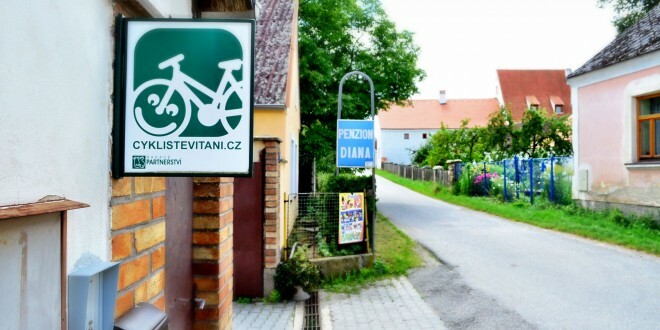 While the entire network isn’t as well marked as others, it is the fact that the Slovenes are beginning to make steps to attract bicycle tourism that is just as encouraging to us. Although we love maps of all shapes and sizes, we secretly want to travel in places that are easy to traverse simply by viewing the route signs from the saddle of our bikes. This trickles down to other impacts as well. 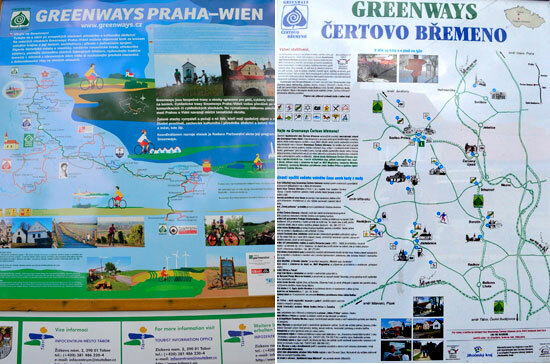 Hotels, shops and restaurants along routes like Prague-Vienna Greenways benefit from the increased tourist traffic. If you’re listening Travel and Tourism boards, advocate for investment in well mapped/marked bicycle route and signage. You will see an influx of a whole new brand of tourist: the Bicyclist. According to a rather non-scientific bike travel poll that we’ve taken on this blog, marked and mapped long distance bike routes are one of the most important factors in determining where to travel by bicycle . Many European countries have done a fantastic job of this. Mark it. We will be there. Sometimes it’s as simple as posting a sign that says “Cyclists Welcome”. If your business wants cyclists to stop, you have to tell us. Either with an ‘old school’ sign or digital advertising. In Czech Republic, Slovakia, Germany and Poland that is exactly what many hotels do. The Hotel organization Cykliste Vitani literally says “Cyclist’s Welcome”. We have stayed at several of these places. They can be found along main bicycle routes and by searching their website. Many thanks for cykliste vitani web site ! Maps to show us where things are (like the all important food shops and bakeries) are great. When you’re cycling in a new area its wonderful not to have to spend a lot of time and effort to find things. People in cars take this for granted, its quick and easy to find what you are looking for even if its several kilometers away when you have a motor to take you. When I traveled the Oregon coast, each hotel I stayed at either did their best to put me on the gorund floor, or let me use the service elevator if the regualr one was too small. And you are correct, a simple bike rack goes a long way inmy decision of where to stay. Worth thinking about if you own a business in an area that has a lot of cyclists!